Full Color Photo Journal comes with the purchase of this album. 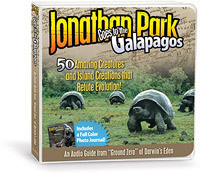 As a free bonus, Jonathan Park Goes to the Galápagos includes a handsome photo journal that offers further details concerning the fascinating animal life on “Darwin’s Eden.” Featuring stunning photography of the creatures from these mysterious islands, this illustrated booklet is a beautiful and informative supplement to this new audio album. Book Measures 4.75 x 4.75 inches. Meet the amazing salt-sneezing marine iguana, the dive-bombing Blue-footed booby, and giant tortoises that live to be more than 150 years old. Engage with the flightless cormorant, a bird that has lost its ability to fly and developed the ability to fish under water. 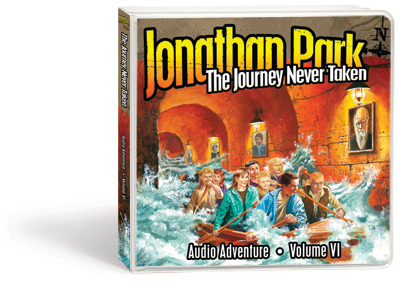 Join Jonathan and his father as they trek into volcanic craters, scuba-dive among sharks, and examine many of the great mysteries of the Galápagos, including this perplexing question: Why do the animals appear to have no fear of man? Learn the truth as the Parks analyze the Galápagos creatures and show how Darwin’s conclusions were wrong. Was Darwin a Good Naturalist? Why is the Flightless Cormorant Flightless? What Makes the Blue Booted Booby Blue Footed? Why Do Marine Iguanas Spit Salt?